Video games get a rough shake. If they’re not openly denounced as child’s play, few people give the rhetoric of procedure—the idea that “playing” can impart something unique—a second glance. As a visual art installation focused on video game aesthetics, “Bit Wars: Art Tribute to 8bit and 16bit Videogaming” had its work cut out for it from the start. Installed at the BLUE1647 tech incubator space in Pilsen as part of EXPO Collective’s October exhibition, “Bit Wars” had to negotiate the fraught line between fawning fan art and meditative homage. The artists chose to work with the imagery of a mass-market medium, drawn from one of its most commercial periods. “Bit Wars” honed in on the eighties and nineties—times when corporate juggernauts like Sega and Nintendo dueled conspicuously in the advertisement pages of a growing games journalism. The threat of kitsch thus hung in suspense over every piece in the show. Could the “Bit Wars” artists make Mario more than the sum of his pixels? “Bit Wars” found its answer in one of the hallmarks of eight- and sixteen-bit gaming: two-dimensionality. The exhibition’s featured games occupied a transitional moment in the history of gaming platforms, between basic vector graphics and the fully fledged 3-D polygonal worlds of contemporary video games. The artwork of ”Bit Wars” calls attention to these first steps towards modern graphics by citing painting’s own preoccupation with flatness. In art history, whole atmospheres of hot air have been puffed out over the fact that a painting is stuff on a flat surface that depicts something through an illusion. “Bit Wars”’ own painters built up their canvasses sculpturally or tinkered formally with paint application. They gestured at the shared preoccupations of games and painting (i.e. making the 2-D believably 3-D and their artistic contrivances more credible). Miguel Estrella’s “Masked Medium” falls into the first category of sculptural canvasses. 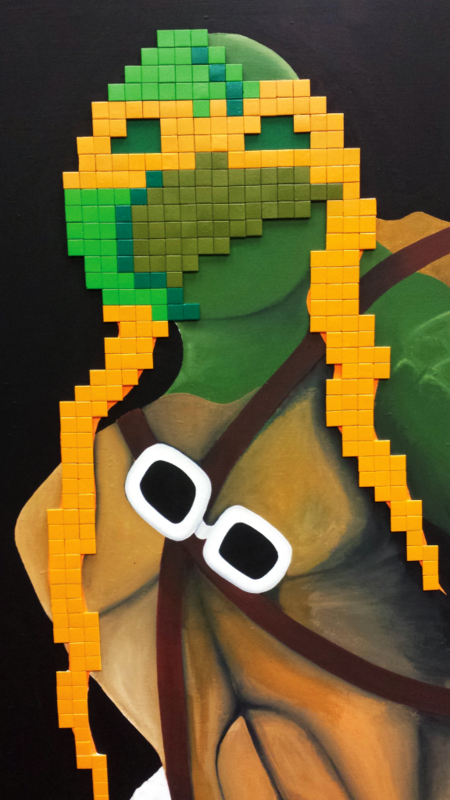 Estrella painted a Teenage Mutant Ninja Turtle, but he renders the ninja’s mask—the turtle’s beak—in a series of square mosaic tiles fastened to the artwork’s surface. The tiles at first reference blocky eight-bit and sixteen-bit pixel art, but more also hide a second ninja mask already painted into the composition. This second mask peeks out from beneath the tiles. In its almost total invisibility, it becomes highly visible. Estrella subverts the purpose of a mask by highlighting it—the ninja’s object of concealment is the artwork’s most salient feature. Estrella consciously probes the tensions involved with working toward a realist style. To correct the flat shortcomings of two-dimensional art and make the turtle more elaborate and prominent, Estrella deploys three-dimensional elements. However, the mosaic tiles end up calling attention to the painting’s basic flatness, just like the painting’s doubled masks give each other away. It brings to mind the dilemma of the “uncanny valley” in modern computer-generated imagery: as art approaches perfect simulation, flaws become highly discernible. By painting no eyes behind the mask—relocating the turtle’s eye in a pair of sunglasses hanging by his chest strap—Estrella flags these complex issues of looking and seeming. The result is an image that is neither entirely 2-D nor convincingly 3-D, as idiosyncratic as the canonical moments of eight-bit and sixteen-bit gaming. “Game Over” by Adam Mageli questions the tricks used to signpost light and shadow. Mageli paints an explosion in the same pixelated style as Estrella, isolating it on a cyan field as its own self-contained object. He introduces two competing light schemes. The explosion is luminous because of the white core at its center and the cooling orbits of yellow, orange, and red expanding outwards. Yet the cyan background has been delicately worked so that it is lighter at the center and darker around the edges. Mageli juxtaposes the relatively limited color ranges of eight-bit and sixteen-bit consoles with the painterly practice of applying hundreds of intermediary tones to suggest that lightless, opaque pigments actually glow. He re-contextualizes this illusionistic technique against an art object that was first rendered on brilliant television screens before it was ever put it into paint. The “Bit Wars” artists approached these perennial 2-D crises from different directions: with sleek panel painting, airbrushes and spray-paint, thick and glossy impasto. They made painting’s formal questions a jumping-off point for understanding gaming’s early adolescence. As art forms, both games and painting have attempted to make the imaginary authentic and present using sophisticated optical deceptions. Painting has spent centuries wringing its hands over the countless problems that follow from those attempts; “Bit Wars” hints that games are ready to tackle that tradition too.